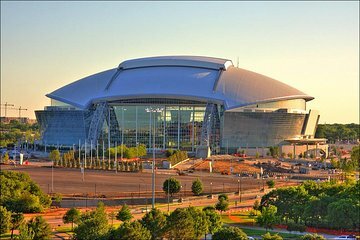 Verken het state-of-the-art voetbalstadion van Dallas Cowboys. Een van de duurste sportstadions ooit gebouwd, het stadion beschikt over enorme videoschermen en luxe voorzieningen. Volg je gids door de plaatsen waaronder de persdoos, privésuites, kleedkamers, post-game interviewruimte en zelfs op het veld. Stadium was great to see but with the cost of the entry ticket at only $27 each, we would have saved a lot by taking a cab or an Uber from Dallas. My wife and I were very impressed with the tour and stadium. I was not sure what to expect but we loved the whole time there. Our guide was great and we would do it again next time we come back to the Dallas area. Tour was almost two hours, not three. Shuttle was an hour. Excellent tour.